I like the thought of them working quietly towards the common goal. I suppose part of it for me comes from the idea of the monks bound by some sort of vow of silence, but the truth is working in unison while singing a tune seven dwarfs style is equally delightful. What truly matters is the spirit of cooperation to make the place more accessible not only for themselves, but for all those who choose to visit – although admittedly this may have been an unintended benefit at the time. In silence or not, the important part in my opinion is that the individuals came together to make lasting and meaningful change. There’s a saying in Greece, “I’m in Meteora.” It means ‘I’m up in the air,’ or ‘I’m in limbo.’ A UNESCO World Heritage Site in north central Greece, outside the town of Kalambaka, is the inspiration for this saying. 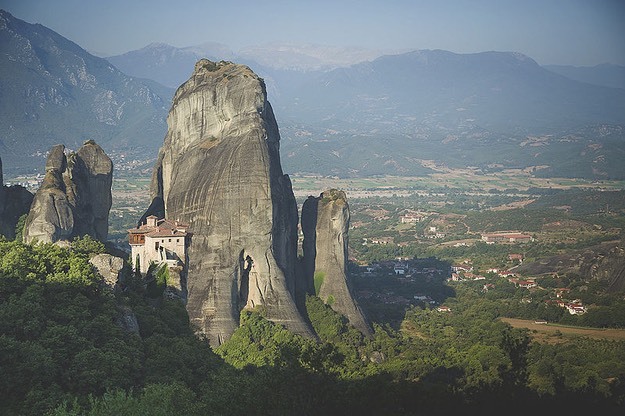 The Meteora (/ˌmɛtiˈɔːrə/; Greek: Μετέωρα, pronounced [meˈteora]) is a rock formation in central Greece hosting one of the largest and most precipitously built complexes of Eastern Orthodox monasteries. Suspended in the air: Meteora from Alexandros Maragos on Vimeo. It is a most fascinating and moving site to be sure. The word majestic comes to mind. �The caves in the vicinity have now been inhabited continuously for as long as fifty thousand years. The oldest known example of a man-made structure at the site, a stone wall that blocked two-thirds of the entrance to a cave, was constructed over twenty thousand years ago, probably as a barrier against cold winds. You see, the earth was experiencing an ice age at the time – so it was certainly in their best interest to seek whatever type of respite from the elements as possible. The area is scattered with inaccessible sandstone peaks and the monks settled on these 'columns of the sky' from the about 11th century onwards. It could best be described perhaps as a rock forest. According to one legend, these rocks were dropped from heaven, as they seem to have risen from nowhere. �Although nature has surely been at work in Meteora for tens of millions of years, human interference has been relatively recent. Hermetic monks migrated to Meteora for isolation, safety, and the most minimal subsistence, living in small slits in the face of the rocks. Eventually, with the help of a well-connected founder and many determined and skilled rock-climbers, the monastic communities began to develop. They built in isolated pockets barely visible to the outside world. Supplies were collected by hand, hauled with donkeys, hoisted by hand with pulleys, and secreted away until the structure could be built and defended. To scale these behemoth rocks in the first place? �In true badass fashion, they rock climbed, of course. �What better place for hermits to live than a place inaccessible to pretty much anyone with a will to live? By living on these peaks, the monks not only sought to bring themselves closer to God but also somewhere to hide in the face of an increasing number of Turkish attacks. At this time, access was limited to say the least. It was, by design, a living arrangement that made them both difficult to visit and get around once one arrived. The absence of forward-looking planning meant that people were not encouraged to consider non-rope-or-ladder options. What we are presented with is an ascetic group of hermit monks living atop these ancient pinnacles; living in hollows and fissures in the rock towers, almost as high as 2000 feet above the plain in spots. This great height, combined with the sheerness of the cliff walls, kept away all but the most determined visitors. The obvious question of course is was, “How many of monks died trying to reach the top over the years?” �However, the question must remain unanswered; we have no way of knowing this and it is something we must forever wonder. Initially, the hermits led a life of solitude, meeting only on Sundays and special holy days to worship and pray in a small and rudimentary chapel built at the foot of a rock. It seems a lonely if well-intentioned life. If nothing else it was the was what many of them had chose and/or all they had ever known and I suspect the wishes to maintain the status quo was prevalent. The monasteries built on these rocks are as unfathomable as the rocks themselves. Sometime around 1350, the first monastery was founded upon the rocks, which was perfect for the monks; they were both safe from political upheaval and had complete control of the entry to their small and protected domain. The only means of reaching it was by climbing a long ladder, which was drawn up whenever the monks felt threatened. The construction of each monastery took many, many years and a whole lot of determination. �I imagine for many it was their life’s work to help build a monastery, even if they may not have lived long enough to see it achieved. Though separated by their distinct silos, the monasteries co-existed and cooperated, sometimes with the help of villagers. But they succumbed to a drop in pilgrimages and revenue, to disease, and to harsh weather. Six monasteries remain open today of the twenty-four that thrived in the 16th Century. The Meteora monasteries give the impression of being the physical continuation of the rocks on which they are built; or rather the rocks look like the physical foundations of the monasteries. The monasteries have left the surrounding landscape largely intact. Until the 1920s, the primary means of conveying goods and people from these eyries remained these baskets and ropes. Nowadays, getting up is a lot simpler due to steps being carved into the rock – clearly not only a faster but also more reliable means of transport. A notable improvement in convenience not only for the inhabitants but also to any visitors and is, of course, the work I referred to at the beginning. Not only were steps were cut into the rock, the complex was also made additionally accessible via a bridge from the nearby plateau. This required of course a major shift in thinking and it is hard to imagine that there was not serious and sustained objections to these proposed changes. I picture some bemoaning the swarms of new visitors the stairs might bring while others likely advocating keeping the status quo until escalators or perhaps elevators were invented. I mean, how far off could personal jetpacks really be? The evolution of the Meteora to encourage ease of getting around meant creating important infrastructure that moved more people, more efficiently. Relative comfort and walkability. I suspect the newly acquired transportation system, in this case stairs started rudimentarily and then gradually improved and grew over time. It required the community to let go of its hermetic past and embracing a new way of thinking. �It meant refusing to further stagnate and taking a chance on another system. This may have been assisted in part by a purposeful and deliberate shift in focus from the monks’ personal salvation and towards tourism and perhaps as a result the salvation of the wider society. To lead by example is impossible if others are unable to witness it. Influence through inclusion. In fact, the monks had long believed that their salvation resulted at least in part to the salvation of the wider society. Providing sustainable, safe, accessible, and reliable transportation now presented every monk and visitor more options. The choice to arrive both safely and sooner. The choice to visit and perhaps even stay longer. Of the thousands of tourists that have dropped by since, myself included, can attest to the fact that it is otherworldly, and an experience you will surely remember for the rest of your life. And none of it possible without the willingness to take the first step which in this case it being an actual first step. It is tempting of course to attribute the introduction of stairs to inevitable progress but I believe that it could only happen once a change in attitude to one of inclusivity was embraced. While there must have been naysayers at the time int seems to me impossible to imagine there are many who don’t believe the results have benefitting both the residents and this who have visited since. The direct results of a community making both difficult decisions and putting in a lot of resources towards a common goal. The Meteora have transformed from a place in limbo to a space of certitude:�freedom from doubt, especially in matters of faith or opinion.